David began his pursuit of music as a youth acoustic guitarist singer-songwriter in NJ. As he grew, he took on live gigs with many bands up until his move to CO where he merged modern technology with his instrumental roots. 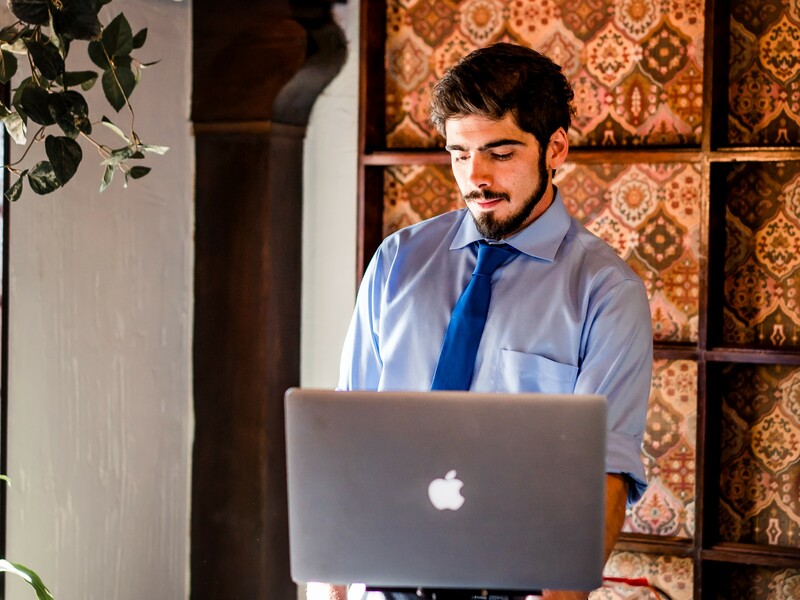 Now a regularly performing wedding DJ and musician in our area, he's adapted his talents to accommodate personalized events. "Though I've played countless gigs, ranging in formality and style, my greatest achievement comes with each "thank you" from newlyweds. I appreciate the recognition and joy I was able to provide more than anything else." The most enjoyable part of DJing for David has always been crowd engagement. Whether it's attentive listeners in their seats with subtle head bobs, tapping feet, and casual singing or a full-blown crazy dance party, David loves sharing the genuine moment. David's experience is extensive. He's been a musician since 2003, a DJ since 2008, and a Wedding DJ since 2013. He's practiced and confident in his talents and loves sharing those talents with you and your family to make your wedding a night to remember. He'll accommodate any out of the ordinary circumstance, whether it's planned or in the moment! He looks forward to connecting with you. "I’m not sure where to start. David was AWESOME, and I couldn’t have hand-picked a better DJ for our wedding reception. We provided a list of songs that were requested from our guests (we had them make note of their dance songs on the RSVP), and David took over from there....bouncing effortlessly between genres of music, and keeping the party (literally) BOUNCING!! We got many messages from people the next day that they didn’t have a voice left after the wedding. I would hire David again....in a heartbeat!!" "David was phenomenal. I outlined the songs and dances I wanted and he stuck to the plan. He asked questions when necessary and took control when necessary. He had a handle on balancing what the guests wanted with what I wanted. I got multiple compliments from family and friends on his performance. He was professional, punctual and organized. We had a lot of communication early on, he responds fast to texts and emails. He did a superb job and I would highly recommend him. He did a good job balancing new “hits” music (bride’s love) with 70s-80s mix (groom’s love). He was cautious about using profanity in songs which wasn’t a problem but we appreciated it. He takes instruction but knows when to lead. I am so happy we booked David."